This chapter presents and discusses current approaches and trends in computer-based modelling of pathways and movement networks in archaeology. After an introduction to the theoretical concepts involved, we present a state of the art of methodologies applied for reconstructing pathways and movement in ancient landscapes and discuss the various difficulties in using these methods as well as the most important technical hurdles involved. The problems of integrating optimal pathfinding algorithms with ‘softer’ socio-cultural variables are highlighted, as well as the limitations of modelling connections between places using least-cost path techniques. Network analysis reconstruction and analysis approaches are then reviewed as tools to better understand the overall structure of movement and communication in ancient landscapes. It is concluded that, while the potential of current approaches for understanding ancient movement is considerable, improvement is still needed in three main areas: the integration of approaches, sensitivity analysis and validation, and the theoretical underpinning of models of ancient movement. In this chapter, we provide an overview of the current approaches to computer modelling of pathways and movement networks in archaeology. The subject has been of interest to archaeologists since the early 1990s, when the first studies were published that tried to reconstruct ancient pathways using GIS (e.g. Van Leusen 1993; Verhagen et al. 1995). Since then, a considerable amount of research has focused on the modelling process itself, by trying to find ways to incorporate the factors that influence movement into the models as realistically as possible in order to arrive at good reconstructions of ancient routes and movement patterns. While clear successes can be observed in this respect, some major questions remain. These are centred around the possibilities of accurately modelling human movement and navigation practices on the basis of archaeological and experimental data, the validation of the models, and the relationship between the modelled routes, communication and transport networks and settlement patterns. The purpose of this chapter is to summarize the main issues in the debate and put them into a larger theoretical and methodological perspective, since such a comprehensive overview is currently lacking. However, we refrain from discussing the results of individual modelling projects in terms of their archaeological interpretation. The chapters that follow (Chaps. 12, Groenhuijzen; 13, De Soto; 14, Parcero-Oubiña et al. ; and 15, Crawford) provide a number of case studies in which this aspect is addressed. 11.2 What is Movement, and How Do People Move? When moving, the affordance thus is the potential offered to an individual within a specific environment to move from one place to another, even when the individual is unaware of this or is not able to take advantage. It is only by considering the reciprocal influence of the environment (geographical, cultural) and the movement capability (technical, social) of individuals that we will arrive at identifying a set of movement affordances. The basic premise of modelling of pathways and movement in archaeology is that we can use the affordance properties of the environment for movement in order to compute the past movement potential for a set of locations, using a GIS, for example (Llobera 2000). Closely related to movement potential is the concept of accessibility. While movement potential is origin-oriented, accessibility considers movement from the perspective of the destination. In a completely isotropic environment, accessibility is the reciprocal of movement potential. In reality, the affordances can vary according to the direction of movement. For example, a site located on a hilltop can have a large movement potential, but not be very accessible. Movement potential and accessibility are, however, only a set of possible, as-yet unfulfilled movement patterns. Modelling the actual movement of people and the pathways they have taken requires us to understand not only the affordances associated with movement but also the goals of movement and the cognitive and social processes that guide movement and structure the development of pathways that may eventually take on a permanent nature, and thereby change the affordances. How to model movement, accessibility, and pathways has therefore been the subject of a substantial and lively debate characterized by a large number of experimental studies that heavily rely on GIS-based data and techniques. Underlying these are a number of assumptions about (ancient) movement that we will shortly discuss in the following sections. The main elements to consider are the movement capability of individuals, the definition of movement potential and accessibility by means of cost surfaces, and the use of least-cost paths as a technique based on optimal path-finding routines. It is common practice in path modelling studies to measure movement capability in either energy expenditure or movement speed. Both are innate to the individual considered: humans walk slower than horses and spend less calories per time unit of movement. However, we have to take into account that modelling of movement capability is usually determined on the basis of averages for healthy individuals. Furthermore, individuals will not always maintain an average speed but can decide to go slower or faster. The calculation of energy expenditure is often preferred because it is a direct measure of the effort that humans or animals will have to make in order to go somewhere while maintaining a certain speed. Ultimately, energy will run out and will need to be replenished with food and/or fuel and rest. It therefore poses a limit to the amount of time that can be spent on movement and thus on the distance covered. Movement speed is more relevant for dealing with types of movement that prioritize speed, such as the deployment of troops, the trade in perishable goods, or the transfer of messages. It is also easier to understand when interpreting and comparing modelled pathways. Movement speed and energy expenditure are of course related, and there are even conversion formulae available (e.g. Groenhuijzen and Verhagen 2015). The human capability for movement differs depending on the mode of transport used, which is in turn dependent on the transport medium (land or water). Almost all studies on modelling land-based movement up to date have focused on walking as the primary mode of transport. This has been studied in sufficient detail to allow for realistic modelling of movement capability, including the effects of carrying a load (see Sect. 11.3.1.1). For other modes of transport, there is much less reliable data available. Riding animals, in particular horses, can obtain much higher speeds than humans and will have been used when longer distances needed to be covered quickly. While average speeds and maximum distances per day covered on horseback or by riding other animals are known from historical sources, good data on the energy expenditure of riding animals are scarce. Some comparisons were made between human and donkey by Yousef et al. (1972), and the effect of loads on the movement speed of horses were studied by Wickler et al. (2001). For carrying heavy loads, pack animals and wheeled transport will have been preferred, although these were not available to all ancient societies. In all probability, the use of pack animals (mostly mules, donkeys, and horses, but also camels, llamas, and elephants) will not have greatly influenced the speed of movement and the distance covered, since there would always be humans accompanying the transport animals. However, in the case of llamas, it seems that they could not travel for more than two days consecutively and would only cover distances of up to 20 km per day (D’Altroy 2015). In the case of wheeled transport, there is only very general information available on the types of carts used, the number and type of traction animals employed to draw them, the maximum loads carried, and the accompanying movement speeds and distances (Bachrach 1993; Roth 1998; Kolb 2000; Yeo 1946; Laurence 1999; Raepsaet 2002; Adams 2007). Water-based transport is another often overlooked transport mode in the modelling of movement, even though rivers in many areas form natural corridors of movement from the hinterland to the sea (Laurence 1999; see also Chap. 10, Bertoldi, Castiglia and Castrorao Barba). Water transport is also capable of transporting much heavier loads than land transport. Relatively little research has been done on the quantification of ancient movement over water. The speed or energy expenditure is dependent on various factors, including the ship type, manner of propulsion (floating, paddling, rowing, sailing, towing, and/or using a push pole), the direction of travel, and the flow of the river. 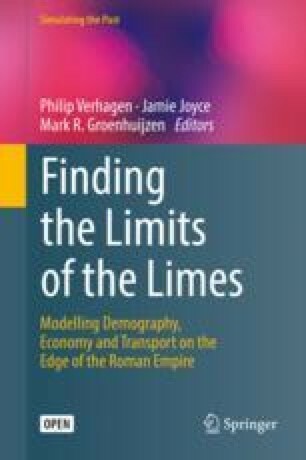 Some information is available on long-distance movement, for example using prams on the Rhine in the Roman period (Jansma and Morel 2007). However, most local transport over water probably made use of dugouts (also known as dugout canoes or logboats), a type of watercraft that has been used at least since the Mesolithic. McGrail (1978) and Gregory (1997) provide an overview of dugouts from the UK and Ireland, including some quantification on speed and load capacity. Ancient sea transport, while having been studied in considerable detail (e.g. Casson 1994; Pomey 1997; Arnaud 2005), is even more challenging to model given the lack of (historical) data on how ships responded to weather and water conditions. The human capability for movement is influenced by external factors that are out of control of the individual, in particular terrain conditions – although atmospheric conditions can play a role as well. Topography, and in particular slope, is the most frequently used environmental factor considered. Steep slopes hinder movement for all modes of land-based transport, up to the point where zones may become impassable. The effect of slope on energy expenditure for walkers has been studied in detail (see Sect. 11.3.1.1). For other modes of land transport, however, the effects of slope are less well defined. A number of other environmental constraints can influence movement capability. One of the most important is the presence of muddy and boggy terrain that can considerably slow down movement or even impede it. Unlike topography, hydrological conditions can change relatively quickly and may have a distinct seasonal component. In tidal zones, conditions will even change within hours. In colder regions, the presence of snow and ice in winter is a factor to consider as well. Movement potential in winter may be quite different from summer, when wet areas will be frozen over that are difficult to negotiate in summer. Vegetation, especially high brush, can also reduce movement capability. There is some experimental evidence available that relates different terrain conditions to the energy expenditure of walkers (Soule and Goldman 1972; Pandolf et al. 1976, 1977; De Gruchy et al. 2017). This evidence is rather limited, and similar data for other modes of transport are not available. Pack animals, however, seem to have no difficulties in keeping up with humans in any form of terrain, although for steep slopes mules and donkeys were usually preferred over horses, since they are better at negotiating this type of terrain. For wheeled transport, critical slopes are clearly lower than for walking (Herzog 2013a), and in difficult terrain, wagons and carts will experience more difficulties than humans and pack animals (Haisman and Goldman 1974). The effects of river crossings on movement capability across land have also been considered in a number of path modelling studies (see e.g. Van Leusen 2002; Fiz and Orengo 2008; Whitley et al. 2010). The procedure followed is usually to consider rivers (and other water bodies) as if they are zones that hinder movement in the same way as very steep slopes. Whitley et al. (2010) instead took the energy expenditure of wading and swimming as input for their models and this would seem to be the most realistic approach to estimate movement capability of walkers in wet terrain. Again, no similar data is available for other forms of land-based transport. We also have to keep in mind that getting one’s feet or body wet comes with additional disadvantages, so the use of water-based transport will quickly become attractive even when the total distance to be covered over water is not very large. For water-based transport, however, much less data is available on the effects of the natural environment on movement, even when some research has been done into modelling the effects of winds and currents on sea transport (see for example the ORBIS project http://orbis.stanford.edu). Human intervention in the landscape can improve movement conditions considerably. Whether humans tried to overcome or reduce the effects of terrain conditions on movement will have depended on the importance attached to moving with little effort from one place to the next and on the technical abilities of ancient societies. Relatively simple measures include clearing the ground to make the going easier in the case of dense vegetation or boulders, the use of stepping stones to negotiate small rivers, and using switchbacks, steps, and stairs to climb steep slopes. More complex solutions are the construction of bridges to cross wider rivers and ravines, paving of roads in the case of wet terrain, and even cutting tunnels to pass steep rock faces. In order to travel larger distances, people and animals also need places to stock up on food and water and find shelter to safely spend the night (Murrieta-Flores 2010). Locations where these facilities are found can be both natural and anthropogenic. Also, places where people could shift between modes of transport, like harbours and horse stables, will have been important logistical facilities. In the Roman period, for example, an empire-wide infrastructure of mansiones, mutationes, and stationes was maintained to provide food, rest, and, if needed, fresh horses. The stageposts along the Inka road system known as tampus also provide a very good example of such an infrastructure. Hyslop (1984) estimates there were around 2000 of them along the ca. 40,000 km of the road network. An important effect of infrastructural improvement is that it will concentrate movement in specific locations, and thereby also increase the possibilities for control of travel and transport (see Sect. 11.2.3.4). Modelling the effects of infrastructural improvement on movement patterns has however not been explored in depth. The factors considered so far are primarily concerned with energy efficiency and maximizing the speed of movement, i.e., they have direct effects on the movement capability of individuals. Many factors that influence movement, however, do not just have an effect on movement capability but also or even predominantly on the perceived affordances of the environment. Unsafe areas in particular will have been avoided by travellers unless they were sufficiently prepared to deal with any dangers on the road. Knowing where enemy groups or wild animals lived – not to mention the residential areas of evil spirits or grumpy ancestors – will thus have been a very important consideration when choosing a route. Many ancient routes will therefore have been determined by the ability to avoid potential dangers, or if this could not be done, to equip them with protective infrastructure, such as forts and watchtowers. Other aspects of safety have to do with weather conditions: a route could become unsafe or even inaccessible because of rainfall, snow or drought, and may have had specific infrastructure to deal with the effects of excessive water, cold or aridity. Modelling safety of movement is highly complex since we usually don’t have much evidence on where hostile groups of humans or animals, or even malicious spirits could be found (see Whitley 2000 for an exception). Visibility must have been an important aspect for this, and in some contexts it is therefore possible to analyse if routes are safer or more unsafe than others on the basis of being hidden from sight (Lock et al. 2014). However, we should not underestimate the role of sound and smell either. Estimating the effects of extreme weather conditions would seem more feasible, but as far as we know there are no studies around that have specifically addressed these questions from a route modelling perspective. Control of routes was important for guaranteeing the safety of travellers, but many societies also used roads and other infrastructure to impose political and economic control on their own or hostile populations. Roads and waterways facilitate the movement of troops and can be used to regulate the access of travellers and goods by means of tolls. Travellers could also be forced to pay for the use of infrastructure and logistic facilities. Obviously, this kind of control system may also have led people to take different, non-controlled routes to escape paying the taxes. A different type of control is supposed to have played a role in the positioning of the Inka imperial road system (Lynch and Parcero-Oubiña 2017). The Inka placed great importance on the symbolic appropriation of spiritual landmarks, in particular the snow-capped mountaintops of the Andes. It is suggested that the positioning of the imperial roads can at least partly be explained by the wish to keep the mountain tops within view over a long stretch of road, and in this way assert the empire’s power over places of spiritual importance. Various authors have pointed out that navigation is inherent to movement (e.g. Lock and Pouncett 2010; Murrieta-Flores 2010), and thus the ease of navigation constitutes one of the major factors determining the affordances for movement on both land and water. Humans rely on sequential and mostly visual cues to find their way in the landscape. Cognition plays a vital role in the human ability to navigate, and the more local knowledge the traveller has, the easier it will become to find one’s way. When travelling in unfamiliar terrain, however, navigational markers are necessary to help travellers arrive at their destination as they allow to provide oral or written instructions for wayfinding, like the famous indigenous Australian songlines. This latter aspect of creating a ‘mental map’ rather than using distance calculations was also relevant for maritime navigation in the Pacific (Turnbull 2000, 136). Permanent roads and water courses will even better guide movement, but even then markers will help the traveller to decide where to go, for example when arriving at a junction. Navigational markers can be both natural and anthropogenic. The most important natural ones are terrain morphology (e.g. peaks, valleys, slope breaks, caves, horizon profiles), hydrology, vegetation, and geology (rock outcrops, boulders). They can be related to both short-distance and long-distance travel. A mountain top or river, or in the absence of such a landmark, the position of the sun or the stars, may provide the general orientation of travel. For navigation over short distances, and especially in circumstances of reduced visibility, local markers are more important. We should also be aware that markers can change their appearance over the seasons: ground can be covered in snow, trees will lose their leaves and water courses may flood or disappear in the dry season. In the absence of suitable natural markers, humans have for a long time created their own ones, for example by erecting standing stones, cairns and milestones or by planting trees. Lighthouses were already in use in Antiquity to aid maritime navigation. Markers can also be used to emphasize the visibility of natural features, for example by placing cairns on hilltops, or by creating rock art (Fairén-Jiménez 2007). However, there will have been myriads of other anthropogenic markers available to travellers, since paths and routes express their character in a number of ways, for example because of their mode of construction, their trajectory including curves and crossings, and the presence of related infrastructure and other human activity in the vicinity of the path. Understanding the role of navigation and markers in movement is a complex exercise, as is demonstrated in the studies by Murrieta-Flores (2014) and Llobera (2015). Researchers have therefore also focused on more general indicators to model the influence of navigation on path location, such as the general direction of movement (Zakšek et al. 2008; Lock and Pouncett 2010) and overall visibility (Lock and Pouncett 2010). Visibility, while being the sense that still provides ‘most information on the structure of space to the brain compared to the rest’ (Llobera 2007, 52), is however only one aspect of how people navigate; smell, sound, and even the touch of the feet on the ground also provide clues on the position of the traveller and will change according to the season. The interest in modelling ancient movement was initially triggered by site catchment analysis studies in the 1970s (Vita-Finzi and Higgs 1970; Higgs and Vita-Finzi 1972). This approach can be characterized as establishing the affordances of a settlement’s environment for agriculture or hunting-gathering, for which movement potential was considered to be the major factor. The area that could be reached within a certain amount of time from the settlement was considered to be the extent of its territory (see e.g. Ericson and Goldstein 1980). Since this analysis involved actually walking the areas around archaeological sites to map the extent of the territories, the utility of creating cost surfaces to quickly calculate and analyse the movement potential around settlements was therefore already clear when GIS arrived on the scene (see e.g. Gaffney and Stančič 1991; Verhagen et al. 1995). However, the possibility to calculate least-cost paths (LCPs) in order to reconstruct ancient movement patterns and pathways was a new addition to the quantitative archaeological toolbox (Van Leusen 1993) and attracted much interest from the mid-1990s onwards. Least-cost path modelling is a method to find the optimal path between two or more locations. First, a cost surface is defined that determines the costs of crossing one grid cell, usually specified in time or energy units spent. A cumulative cost surface is then created from a starting point which will provide the cost distance from the starting point to every grid cell in the study area. Finally, we can then determine the least-cost path between the starting location and any other location, giving us some idea on where transport and movement may have taken place. The cumulative cost surface can also be used to find the area that can be reached within a certain amount of time (or by spending a maximum amount of energy). Applications of path modelling are not just found in archaeology but also in economic and human geography (see Rodrigue et al. 2017) and to a lesser extent in ecology (see Cushman et al. 2013). In these disciplines path modelling is used to understand and predict movement patterns of traffic, goods and people (in geography) and animals (in ecology) within a constrained environment. These constraints are either natural, or created by human intervention. In contrast to archaeology, however, the movement processes modelled in geography and ecology can still be observed today. Archaeologists and historians, on the other hand, are confronted with the fact that factors influencing movement patterns and transport networks have changed considerably in the recent past. Both the capacity of humans to intervene in the landscape and create new possibilities for movement, as well as the modes of transportation are completely different from those in prehistory, or even from a period as recent as the nineteenth century (see e.g. Lawton 2004). Analogies from modern day transportation are therefore not very suitable for archaeological applications. However, reliable information on how people dealt with these issues in the past is limited. Researchers therefore have to rely on modern-day data, such as physiological research into the speed of movement of humans in different environments, and use the scant historical evidence, for example by applying data from historical military sources to situations that did not involve the movement of troops. Furthermore, the underlying premise of GIS-based modelling of movement and pathways is the calculation of optimal, least-cost or least-effort paths. This is an assumption that is very restrictive when investigating past movement (see e.g. Ingold 2011), and many studies in archaeological path modelling over the past decade have tried to come to grip with this. The main issues to be considered have been summarized in various papers (e.g. Murrieta-Flores 2010; Herzog 2014), but it is useful to provide a condensed overview here. Most modelling studies in archaeology have been explicitly interested in movement on foot and assume that slope was the main constraint to movement. While slope clearly is a major factor influencing movement capability, we already listed a number of other factors that can be considered. The popularity of slope as the primary cost factor is therefore not just related to its (perceived) archaeological importance, but also to the fact that elevation data is relatively easy to obtain, and can usually be considered a reasonable approximation of the topography in the past, since it is the most stable and enduring geographical factor. Also, walking on slope is the only type of movement for which there is reasonably detailed experimental evidence (Margaria 1938; Imhof 1950; Givoni and Goldman 1971; Pandolf et al. 1977; Ericson and Goldstein 1980; Minetti et al. 2002; Langmuir 2004; Kondo and Seino 2010). Herzog (2013a) provides an overview of the different cost (or ‘hiking’) functions that have been used to estimate the effect of slope on walking speed and energy expenditure. She compares these functions to the data collected by Minetti et al. (2002) when walking on a slope and presents a 6th order polynomial function that best approximates the experimental data. The alternative equation developed by Llobera and Sluckin (2007), however, seems to better match the empirical data. Since these equations only provide values for energy expenditure, they cannot be directly converted to time units, which are easier to understand and compare. By far the most popular hiking function in archaeology has therefore been the one attributed to Tobler (1993). Similar functions for riding or pack animals and wheeled transport are not available because of a lack of experimental data. It has been noted (Llobera and Sluckin 2007; Herzog 2013a) that there is a critical upward slope for vehicles beyond which movement is not possible. As far as we can tell, however, the only equation that directly connects slope, and to some extent terrain friction, to movement of carts is given by Raepsaet (2002). When calculating LCPs using slope-based hiking functions, it is important to keep in mind that upslope movement will lead to different paths than downslope movement, and therefore ‘isotropic’ cost distance calculations are unsuitable to estimate the optimal paths. A further problem with slope-based cost surfaces is that slope in GIS is always calculated as the average of slope from a grid cell to its 8 neighbouring cells. However, in order to find the optimal path, we need to know the slope in the direction of movement, or effective slope. Solutions to this problem have been implemented in various GIS packages (IDRISI, SAGA, ArcGIS), but Herzog (2013d) showed that the existing tools are either not implemented correctly or lack sufficient documentation to judge their performance. Alternative approaches, taking into account the general direction of movement, have been presented by Zakšek et al. (2008) and Lock and Pouncett (2010), but in practice there does not seem to be agreement on the best way to proceed. Herzog (2014) also discusses the problems associated with creating LCPs from digital elevation model (DEMs). Most available DEMs are not well suited to create cost surfaces and least-cost paths for archaeological research questions. LiDAR-based elevation models are very popular with archaeologists nowadays because of the level of detail they provide. However, their high resolution is also a drawback for path modelling since many modern-day, anthropogenic landscape features are present in the models as well, and filtering techniques to easily suppress these are not sufficiently developed yet. The vertical and horizontal accuracy and/or precision of the popular and free Aster and SRTM products on the other hand is often not sufficient for a realistic calculation of the accumulated cost surfaces. Also, interpolation techniques used to create DEMs from digitized contour lines and irregularly spaced point elevations can greatly influence the results. A well-known effect is the creation of artificial elevation ‘steps’ in relatively flat terrain because of very widely spaced contour lines. Ideally, DEMs used for LCP modelling should be based on corrected and sufficiently detailed height information that ignores recent anthropogenic features, and takes into account recent natural changes in topography as well. This often still implies correcting the DEMs manually, for example by consulting and (partly) digitizing historical elevation maps. Lock and Pouncett (2010) and Lock et al. (2014) point out that scale is also an important factor influencing the results of slope-based path modelling. The horizontal resolution of a DEM will have a marked effect on the end results, as is for example shown by Verhagen et al. (2014). A DEM at a resolution that is too coarse may obscure difficult passages, especially the occurrence of cliffs, since these have a very limited horizontal extent (width). A cliff with only a few meters height difference is in practice impassable, but an elevation difference of 5 m will not seem very important when the cell size is large enough. The slope at 5 × 5 m resolution will be 100%, but at 50 × 50 m only 10%. DEM resolution also influences the results of path modelling when introducing linear features like rivers and cliffs as barriers or zones of difficult access, because of the effect of diagonal crossing (Van Leusen 2002). Other terrain factors directly influencing movement capability, in particular vegetation and soil type, would seem easier to model since their effects are isotropic, but in practice they are more difficult to estimate. Experimental data on energy expenditure when walking through various types of terrain were published by Soule and Goldman (1972) and Pandolf et al. (1976) and converted to terrain coefficients reflecting the difficulty of movement (summarized by Herzog 2014). A recent study by De Gruchy et al. (2017), however, indicates that these coefficients cannot be translated directly to movement speeds. For movement of vehicles, it is even more difficult to obtain reliable estimates. Groenhuijzen and Verhagen (2015) therefore combined the terrain coefficients obtained for handcarts by Haisman and Goldman (1974) with data on average movement speeds of vehicles reported from historical sources (Roth 1998). Water-based transport has to take into account the direction of movement (upstream of downstream, which can be included through artificial slope; Groenhuijzen 2018), the flow of the river and the costs of moving between land and water. Wheatley and Gillings (2002, 156–157) suggest to model waterways as part of multimodal pathways as low-cost corridors which can be accessed through a barrier of high costs. Whitley et al. (2010) included portage of canoes as a cost factor as well. As mentioned in Sect. 11.2.2.2, some experimental and historical information is available on sailing speeds for different types of vessels, but in practice it is very challenging to model all aspects influencing movement capability on water. Possibly the most frequently considered non-terrain-based cost factor in pathway modelling is visibility, because of its close relationship to navigation, safety, and road construction practices but also because it can be relatively easily modelled on the basis of DEMs. The interest in visibility as an aspect of strategic placement of settlements, military infrastructure and monuments has a long history, and has been extensively explored in archaeological GIS studies (e.g. Gaffney and Stančič 1991; Wheatley 1995; Ruggles and Medyckyj-Scott 1997; Loots et al. 1999; Lake and Woodman 2003; Llobera 2003; Trifković 2006; Gillings 2009). The inclusion of visibility as a cost factor for movement is usually approached through the calculation of total viewsheds (Llobera 2003) within the region of interest, and then adding the relative visibility of each grid cell as an additional cost. The drawback of this approach is the heavy computational load associated with total viewshed calculations. For this reason, Verhagen and Jeneson (2012) used openness (Yokoyama et al. 2002) as a proxy for visibility. Recent studies (Bourgeois 2013, 105–158; Čučković 2015) have drawn attention to the fact that networks of intervisibility of archaeological sites and prominent landscape features can be successfully modelled and analysed, and may be of interest for understanding navigation and movement as well. Herzog (2013a) discusses how to use parameters not related to movement speed in path modelling, like visibility or the presence of particular features attracting or repelling travel. ‘Socio-cultural’ costs are not based on expenditure of energy, and the resulting models will therefore not necessarily result in ‘optimal’ paths. Since the costs cannot be expressed in units of time and energy they need to be translated into a different ‘currency’, using some form of subjective weighting. This can produce confusing end results, since the costs then calculated are no longer real costs but ‘pseudo-costs’. The basic procedures for combining factors that are not intrinsically comparable are covered by the literature on multi-criteria analysis (MCA ; Saaty 1980; Nijkamp et al. 1990; Malczewski 1999), a technique that is quite commonly applied in archaeological predictive modelling (Dalla Bona 1994; Verhagen 2006) and which has also been used for path modelling (Howey 2007). Importantly, the weighting of factors can take place at two levels: the attribute level (e.g. where it concerns the importance of visibility with increasing distance) and the criterion level (e.g. whether visibility is a more or less important factor to consider than slope). Normally, the weightings in MCA are based on expert judgement, preferably obtained by consulting a number of experts who then express their weight preferences using a procedure known as pair-wise comparison (Saaty 1980; Verhagen 2006). However, there is no objection to using different weighting methods or to include ‘fuzzy’ weights. Many published case studies in archaeology concerned with the reconstruction or prediction of ancient movement are modelling linear connections between two or more locations. This is mostly because the LCP toolboxes in GIS packages only calculate a single optimal route between start- and endpoints. The shortest path algorithms used in GIS are based on the work of Dijkstra (1959) and other computer scientists (Hart et al. 1968) who wanted to find efficient solutions to the problem of finding the shortest path in a graph consisting of multiple, unevenly spaced nodes. Movement in a grid is a special case of this, since all the nodes (grid cells) are evenly spaced. It is only by attaching differential costs to moving from one grid cell to the next that we can apply shortest path algorithms in a raster-GIS environment. The assumption of a linear route is true for single travels, but the paths taken for multiple travels may shift in location, especially if these are continued over long periods of time, and when the routes are not consolidated by means of infrastructural amenities. Therefore, archaeologists have also explored the possibility of defining corridors of movement on the basis of cost surfaces, as a more fuzzy and possibly more realistic approach to reconstructing and predicting ancient movement patterns (e.g. Howey 2011; Murrieta-Flores 2012; Van Lanen et al. 2015a; Howey and Brouwer Burg 2017). Some attempts have also been made to model potential movement patterns via agent-based modelling (ABM ; Herzog 2016). The advantage of this approach is that the modelled paths are not deterministic: the agents can react to stimuli of the environment, and they can interact with other agents moving in the landscape. These models can also be used to simulate the spatio-temporal development of movement patterns. Simulation models are very well suited to investigate all kinds of socio-cultural processes, but they are often based on highly abstracted representations of environmental and archaeological settings involved, whereas GIS-based studies often aim for more realistic representations. Furthermore, the few ABM studies around (e.g. Lake 2001; Wren et al. 2014) have mostly focused on dispersal, for example in the context of foragers looking for food or hominids moving out of Africa, rather than on the goal-oriented movement that is more commonly modelled in GIS. An exception to this is the study into army movement by Murgatroyd et al. (2012), who used computer-intensive ABM to model the logistics and most probable marching route of Byzantine troops on their way to the lost battle of Manzikert. LCPs and corridors assume travel between fixed start- and endpoints, an assumption that is not necessarily valid when studying movement in the past. Non-agricultural societies, for example, can be highly mobile, so routes and pathways will be highly variable as well, depending on the availability of mobile or seasonal resources. Furthermore, the archaeological data sets we use are incomplete and do not provide us with all the clues we need to model ancient routes. Methods to predict potential routes can therefore be very useful. A first step in this direction can be to model the movement potential for a set of locations (see Herzog 2013c for an in-depth overview). As indicated earlier, movement potential is closely related to accessibility but not its exact reciprocal. Llobera (2000) introduced the concept of ‘total path costs’ as a proxy for movement potential. By calculating for each grid cell the average costs of moving to every other grid cell within a predefined radius it can be analysed at various scales (local, middle range, global). Mlekuž (2013, 2014) developed a similar method of calculating ‘potential path fields’, which proceeds by summing accumulated cost surfaces (‘site catchments’) for every single grid cell. This method can also be used to analyse movement potential at multiple scales. Herzog and Yépez (2013), lastly, introduced ‘least-cost kernel density estimation’ to obtain movement potential maps, giving a higher weight to the areas closer to the point of departure. All these methods are computationally intensive on larger grids. It has to be emphasized that all published examples are based on the calculation of terrain costs influencing walking speed, in particular slope. A map of movement potential based on least effort is not yet an indicator of probable movement patterns. Whitley and Hicks (2003) therefore experimented with creating multiple LCPs crossing a region from edge to edge, maintaining a regular distance between the start- and endpoints, and then cumulated the results. This idea was also applied by Zakšek et al. (2008) and Fovet and Zakšek (2014), using multiple LCPs connecting known settlements, and was further explored by Murrieta-Flores (2012). Using this approach, the LCPs will concentrate in specific locations, and their density can then be used as a proxy for the probability of movement. This concept was taken further by creating LCPs from regularly placed departure points in a region, running either to the edges of the study region or to a number of terminus points within a predefined radius of movement. This approach was independently developed by White and Barber (2012), who named it ‘From Everywhere To Everywhere’ or FETE modelling and by Verhagen (2013) who referred to it as ‘cumulative cost path’ or CCP modelling. Llobera (2015) created similar patterns by calculating LCPs between random locations at varying distances. Herzog (2013c) notes that this approach has drawbacks in application: the concentration of paths is not dependent on the absolute costs involved, so even in areas where movement costs are generally high there still will be many paths. A different approach to the problem of modelling potential routes is presented by Llobera et al. (2011), who used hydrological flow accumulation algorithms on accumulated cost surfaces, first experimented with by Fábrega Álvarez (2006), to create a ‘focal mobility network’. A similar procedure was published in the same year by Frachetti (2006). It results in the creation of multiple, converging paths from the edge of the accumulated cost surface to the point of departure (see also Chap. 14, Parcero-Oubiña et al.). The locations where the paths converge can be considered as nodes in a network, and a ‘mobility basin’ is then defined as the number of cells ‘draining’ into a node. While substantial debate has thus been directed towards the definition of cost parameters and the best ways to calculate movement potential and pathways, sensitivity analysis and validation of the models has been of less concern (see also Kantner 2012). Sensitivity analysis will reveal the effects of changing the parameters that are entered into the model, and it has a solid tradition in computational modelling outside archaeology (Brouwer Burg et al. 2016). Since path modelling is based on three different steps (cost definition, creation of accumulated cost surfaces, and least-cost path calculation), we can make comparisons and perform sensitivity analyses in all three stages. Of these, the comparison of cost definitions is the easiest, since we know the equations and/or weighted costs involved, and GIS offers good tools to compare these by making overlays and obtaining spatial statistics. It therefore may come as a surprise that such simple analyses are never presented (the authors of this paper plead guilty as well). Comparing accumulated cost surfaces is more complicated, since we will have to compare them for each and every starting point (and maximum distance, if applicable). This is an exercise that has never been published either, as far as we are aware. Comparison of individual LCPs or movement corridors is a more common procedure (e.g. Howey 2007; Gietl et al. 2008; Verhagen and Jeneson 2012; Kantner 2012; Herzog 2013a, d; Verhagen et al. 2014). In most cases this is only done visually. Aspects like path length, deviation, sinuosity (Mueller 1968) and path travel time, however, are relatively easy to calculate, and can be used to assess the relative efficiency of the routes. Also, the characteristics of the paths can be quickly analysed by overlaying them on one or more of the cost factors used or on other environmental characteristics, for example to see where the paths are crossing difficult terrain. However, this becomes computationally expensive when doing this for a large number of paths. Validation of path models is very comparable to sensitivity analysis, the only difference being that it compares the model outcomes to empirical data such as field observations, indigenous knowledge or ethnographic accounts and/or historical documents (e.g. Howey 2007; Becker and Altschul 2008; Fiz and Orengo 2008; Polla 2009; Fovet 2010; Murrieta-Flores 2014; Verhagen et al. 2014; Güimil-Fariña and Parcero-Oubiña 2015; van Lanen et al. 2015b; Supernant 2017; Fonte et al. 2017). Most work so far has been concerned with establishing the accuracy of the reconstructed routes in comparison to the available evidence. This is because a correct prediction is desirable from a heritage management perspective, but also because the interpretation of the functioning of the path or road system can only give meaningful results if it departs from a correct reconstruction. The chances of successfully predicting a stretch of road will obviously increase with the number of available independent sources for testing the model. There currently seem to be no standard methods for judging the reliability of the predictions of pathways, even when methods for assessing predictive model performance are well established (Kvamme 1988; Verhagen 2008; Verhagen and Whitley 2012). The most commonly applied approach is to analyse the distance of the modelled paths to the archaeological and historical evidence (e.g. Bell and Lock 2000; Ejstrud 2005; Fovet 2010; Güimil-Fariña and Parcero-Oubiña 2015; Van Lanen et al. 2015b; Fonte et al. 2017): the more traces of roads and other evidence that are found close to or aligned with the modelled pathways, the better the model is thought to perform. However, some of these studies do not provide a statistical assessment of the reliability of the modelling results. In terms of computational efficiency, the comparison of large numbers of path models can only be profitably approached through statistical simulation modelling techniques. These have not been applied extensively to questions of path modelling yet (in contrast to visibility analysis; see Lake and Ortega 2013), and this is almost certainly due to the use of GIS as the exclusive toolbox for path modelling. While GIS has many virtues, efficient statistical computing is not one of them, whereas standard statistical simulation techniques such as Monte Carlo-analysis and bootstrapping are not primarily intended for use with spatial data. A middle ground between the two is not available at the moment, so performing sensitivity analysis and validation of path models still requires combining different software solutions and programming. Pathways are always part of a network. They are connected to other paths that can be combined into routes that can be travelled in any order, not just the shortest or most efficient one. The network perspective changes the way in which we analyse movement: whereas cost surfaces consider the totality of the space that can be travelled, a network of paths represents a linear set of affordances for movement that limits travel to the network’s structure. While this has some disadvantages from a theoretical point of view because it neglects the possibility of movement outside the path network, it also has strong analytical advantages since the properties of the network can be used to better understand the structure and development of (reconstructed) networks (see e.g. Gorenflo and Bell 1991; Brughmans 2010; Collar et al. 2015). Social network analysis was developed in sociology in the 1970s and was initially only concerned with non-spatial relationships. Over the past decade, network analysis has become a major field of archaeological and historical investigation as well (see Knappett 2013a; Brughmans et al. 2016) with studies focusing on (supra-)regional trade and communication networks (e.g. Earl and Keay 2007; Sindbæk 2007, 2015; Knappett et al. 2008; Knappett et al. 2011; Carreras and De Soto 2013) and the possible development of social networks on the basis of observed finds (e.g. Mills et al. 2013; Coward 2013; Golitko and Feinman 2015). Archaeologists, however, have been keen to include geographical aspects in their studies as well (e.g. Carreras 1994; Isaksen 2007; Brughmans 2010; Coward 2013). From a network analysis perspective, LCPs are graphs connecting two or more nodes via (weighted) edges. The only real difference with ‘standard’ network models is that the ‘edges’ have an irregularly shaped spatial extent. The shape of the pathways is not essential for performing network analysis, but the cost-distance between nodes is. Using relative distances instead of Euclidean ones can potentially lead to different configurations and thus interpretations of the networks. Several authors (Kaddouri 2004; Llobera et al. 2011; Herzog 2013b; Verhagen et al. 2013; Verhagen et al. 2014; Groenhuijzen and Verhagen 2015, 2016; Orengo and Livarda 2016) have explored the potential of using network analysis techniques with path modelling. Moving from LCPs to network analysis however implies that we first need to reconstruct the full network of possible connections. Network analysis can only be undertaken when we know which places to connect. In the majority of case studies, the places where movement starts and ends are taken from settlement data, and to a lesser extent from places of symbolic or strategic interest, or where resources could be obtained. The existence of these connections is mostly inferred from theoretical considerations and from material evidence of exchange of goods and people. The nature of movement, its frequency and the distances covered, however, are more difficult to establish, which is where LCP modelling comes in. Connections can be modelled most easily when we only consider direct links between the two nearest points (see e.g. Van Lanen et al. 2015b). This conceptually simple model is however problematic for two reasons. First of all, direct connections to places further away may have existed as well. And secondly, the archaeological record will not always tell us where the nearest connected place was. Both chronological inaccuracy and incompleteness of survey data sets will complicate the reconstruction of all existing connections. Apart from the supposed start- and endpoints of movement, waypoints should be considered as well. Waypoints can be defined as locations that provide navigational aid and/or logistical support during travel. Certain waypoints will strongly concentrate movement because they provide easy access through difficult terrain, like fords, bridges and stairs. Many waypoints, however, are of a more ephemeral nature than settlements, and are therefore difficult to include in path models. There is also a reciprocal relationship between the two: paths may be chosen because of the presence of natural features that support travel, but since humans adapt the landscape, human-made waypoints may become an integral part of the path system as well. From a technical point of view we can either treat them as additional nodes to be connected, or add them as attractors to the cost surfaces using a distance decay function, so that the modelled paths will have a higher probability of passing through the waypoints. Path modelling routines in GIS are not very efficient for network (re)construction since they do not allow for simultaneously connecting multiple nodes on the basis of standardized criteria. Commonly used and effective network construction techniques limit the number of allowed connections on the basis of distance and/or the number of closest neighbours (see Gorenflo and Bell 1991; Jiménez Badillo 2004; Rivers et al. 2013; Groenhuijzen and Verhagen 2017; Fulminante et al. 2017). This limitation is necessary in order to prevent the creation of spurious connections, since direct links from everywhere to everywhere are not realistic. Note that this approach does not exclude the existence of long-distance connections, it only constrains the number and length of direct connections. A common approach to define the thresholds for direct connections between places is to use gravity models derived from economic theory and urban geography (see Hodder and Orton 1976, 187–195 for an introduction). These are based on the assumption of a decrease in interaction potential with increasing (cost) distance. Gravity models can be created by simply calculating accumulated cost surfaces around sites. Instead of assuming a linear decrease in interaction potential with increasing travel time or energy expenditure, an exponential decrease is then specified in a deterrence (Evans and Rivers 2017) or distance decay function (Nuninger et al. 2006). This assumption is based on the consideration that interactions are much more probable over short distances. The functions can further be weighted according to the (hypothesized) importance of nodes in the network. Archaeologists who explored the utility of gravity models in the 1970s (e.g. Plog 1976; Crumley 1979) often used settlement size as a weighting factor, but other factors were included as well (e.g. Hodder 1974; Jochim 1976). Nuninger et al. (2006), for example, considered distance, hierarchical categorization of settlements and visual control to estimate the strength of interaction between nodes. A network can then be set up by creating direct connections between places that fall within a predefined maximum weighted (cost) distance threshold. A further refinement can be introduced by limiting the number of allowed connections, using some form of nearest neighbour analysis (e.g. Broodbank 2000). However, depending on the approach chosen, these techniques can result in the creation of unconnected network clusters, and the various methods will inevitably result in different configurations. Furthermore, creating optimal connections between pairs of points is not necessarily optimal for the network as a whole. So-called Steiner points (extra nodes to be used as junctions) can be inserted in order to optimize the connectivity of the whole network, but applying this principle to cost surfaces is very challenging (Frommer and Golden 2007; Verhagen et al. 2014). Sensitivity analysis and validation of the resulting networks would therefore seem an important issue, but best practices for assessing the realism of (re)constructed networks are still largely lacking (Knappett 2013b; Groenhuijzen and Verhagen 2017). The realism of the (re)constructed networks is also influenced by the completeness of the dataset of places to connect. Lack of information on presence and dating of sites is a common feature in archaeology and may influence not just the network configuration, but also all resulting analyses. Bevan and Wilson (2013) and Paliou and Bevan (2016) approached this by adding simulated settlements in the modelled network, based on a prediction of suitable site locations. By repeating this procedure a large number of times, it could be assessed whether the resulting networks’ characteristics were stable or not. Davies et al. (2014) and Groenhuijzen and Verhagen (2016) used a similar approach. In their case the site dataset was assumed to be relatively complete but lacking in chronological precision, making it difficult to interpret the evolution of the network through time. By repeatedly taking subsamples of the dataset and creating networks from them, the robustness of the observed patterns could be established. Network analysis metrics come in two flavours, global and local (Wasserman and Faust 1994; Collar et al. 2015). Global descriptors, such as average shortest path length and clustering coefficient, give insight into the level of integration of the network: are all places well connected to each other, or is the network fragmented? Local descriptors are primarily used to understand the position of individual nodes in the network through the concept of centrality: which nodes are most advantageously positioned in the network? These local metrics, such as degree and betweenness centrality, are well suited to study the hierarchical structure of the network. Analysis of the network links (edges) is less common (Knappett 2013b). Weighted edges are however a common feature in studies analysing the exchange of material culture (e.g. Golitko and Feinman 2015) in order to understand the relative importance of the connections. The studies by Kaddouri (2004) and Nuninger et al. (2006) similarly attached weights to links on the basis of the size of the settlements involved. In most published studies the edges are undirected, i.e. there is no difference between going to and from a place. However, some places will act as ‘hubs’, attracting goods, wealth, and workforce, whereas others are only net suppliers of, for example, mineral resources, food, or people. The edges between the network nodes will then be directed and have different weights depending on the direction of flow (see e.g. Rivers, Knappett & Evans 2013). Alternatively, network analysis can be approached through space syntax (Hillier and Hanson 1984; Bafna 2003), which analyses the movement through the network (the routes), rather than the flow to and from the nodes. Unlike the approaches discussed earlier, space syntax assumes an existing fabric of connections and is not concerned with the (re)construction of networks. Nodes are only recognized as junctions of routes and carry no weight. Archaeological examples are mainly restricted to the analysis of architectural complexes (e.g. Chapman 1990; Blanton 1994; Banning 1997; Van Dyke 1999; Clark 2007) and urban street networks (Stöger 2008, 2015), although it has been extended to non-urban contexts as well (Hudson 2012; Craane 2013), and it can be combined with other network analysis approaches (Verhagen et al. 2013). Networks created using least-cost path modelling are relatively easily integrated with space syntax (Verhagen 2013; Verhagen et al. 2013). Combining path models with node-based network analysis is also feasible and gradually becoming more common (Coward 2013; Bevan and Wilson 2013; Groenhuijzen and Verhagen 2015, 2017; Paliou and Bevan 2016), but we are still a long way from a full integration of both approaches. A significant obstacle is still found in the fact that common network analysis tools are not capable of directly using cost surfaces to (re)construct networks, or to calculate network metrics using non-Euclidean distances. Also, the question of model validation looms large and was mostly ignored in earlier studies. Validation attempts have tried to establish the validity of either the (re)constructed connections or the assumed importance of the nodes in the network. Nuninger et al. (2006), for example, compared the results of their network reconstructions to archaeological expert judgement. Rivers et al. (2013) similarly ranked a set of sites for importance based on archaeological considerations and compared this to the ranking obtained from the constructed networks. Davies et al. (2014) reported that the modelled distribution of site sizes in their case study was in good agreement with the archaeological evidence. Even then, it was not possible to make precise predictions, and this was attributed to the influence of other, non-geographical factors. As far as we can tell, similar studies attempting to establish the relative importance of routes are lacking. Fulminante et al. (2017), however, present a straightforward method to compare modelled networks to observed ones by taking into account the differences in network descriptors. An advantage of using formal network analysis is that it can be applied independently of assumptions about political, social, and economic structure and interaction. At the same time, this can be a drawback if we want to understand how real-world networks of movement and transport originate, function, and develop. The centrality metrics are only measures of potential interaction in a spatial or non-spatial network. In the context of transport and communication networks, this means that a node in an advantageous position does not necessarily attract movement. The actual movement patterns also depend on many other factors such as the importance of sites for trade, administration, and/or ritual purposes and the availability of logistical facilities. The overview of approaches presented in this paper shows that the scope for understanding movement on the basis of computer modelling is as substantial as it is complex. Improvements are still needed on a number of topics, especially where it concerns a better integration of tools and methods with theoretical insights. There still is a lack of comprehensive and user-friendly tools for both path modelling and spatial network analysis. The available modules are highly inflexible when it comes to experimenting with different parameters. Also, many tools lack good documentation of the algorithms employed, essentially providing nothing more than a ‘black box’. At the same time, adapting and reprogramming existing software is a task that is beyond the capabilities of individual researchers. Open source software development, which is needed for this, has clear advantages in terms of low costs to end users and the options it offers for collaborative work with scientists from different disciplines, but its weakness is its dependence on volunteer and project-based work, leading to the uneven development of toolboxes and the release of software packages that are not fully tested. The current interest in R as a spatial analysis tool, however (see, e.g. http://www.rspatial.org/ and https://elementr.hypotheses.org/), shows that open-source toolbox development can rapidly gain momentum, given sufficient interest. Unfortunately , most archaeologists, including those working with GIS on a regular basis, do not have the required mathematical background to fully understand the algorithms used for LCP modelling and network reconstructions. Herzog (2013a) cites a number of papers where equations are represented wrongly, or interpreted in the wrong way. Improvement of the existing algorithms, coupled to tools that can create models using multiple algorithms, is therefore urgently needed. These tools would also need sophisticated options for sensitivity analysis of the model outcomes. A fundamental issue for pathway modelling is validation of the modelling results. This is only partly a matter of having sufficiently detailed archaeological data to judge the realism of model outcomes. A side-by-side comparison of different modelling outcomes is currently often a very demanding exercise, even when the goals and approaches are fairly similar – see e.g. Verhagen et al. (2013) on comparing space syntax and SNA, or Gietl et al. (2008) on comparing different LCP algorithms. In practice, therefore, the outcomes of single models are often presented as the only possible representation of the research results. Even while chronological uncertainty and incompleteness of datasets will always be part archaeological research practice, sensitivity analysis therefore needs to become part of the standard methodology for pathway and network modelling in order to assess the quality of the presented models (see Bevan and Wilson 2013; Groenhuijzen and Verhagen 2017). There are good reasons for advocating parsimony in modelling: sensitivity analysis of models will be less challenging, and most of the variation in model outcomes is often due to a limited number of variables anyway. The middle-range theoretical approach advocated by Verhagen and Whitley (2012) can be applied to reduce the complexity of modelling by exploring cause-and-effect relationships in clearly circumscribed spaces, especially since much archaeological data is providing anecdotal rather than quantitative information (see also Lovis 2016). ‘Scaffolding’ of models is then a good approach to sequentially introduce extra complications into the models without making them unmanageable, as is for example demonstrated by Güimil-Fariña and Parcero-Oubiña (2015). Nevertheless, we should remain aware that all models are inherently flawed. Using GIS is best seen as a dynamic and eclectic practice of research (cf. Hacιgüzeller 2012) or even a form of experimental archaeology (Whitley 2017). However, this does not imply an attitude of ‘anything goes’. Providing a clear argumentation for the choice of parameters, equations, and/or algorithms used will avoid the danger of applying ‘push-button’ approaches without understanding their implications (Brouwer Burg 2017). Much of the debate on LCP modelling has centred around the question of the realism of hiking functions and the estimation of energy expenditure and movement speed for other forms of transport. The experimental data available are mainly dating from the 1970s, and little work has been done to repeat and evaluate the experimental results. Some of this is going to be highly challenging, for example, if we want to understand the movement capabilities of ancient wheeled and water transport. A more thorough study of historical accounts, however, might be valuable to obtain more quantitative data on speeds of movement and energy expenditure. One of the enduring criticisms of LCP modelling is its emphasis on establishing optimal connections between places, whether these are based on consideration of energy expenditure or other aspects, such as optimal visibility. The relationship between theoretical principles of movement and navigation, observed and hypothesized movement practices, material traces of pathways, and modelling therefore needs to be further explored. This is a very complex field of study that should be addressed at various scale levels and for different movement practices. For example, the practice of wayfaring (Ingold 2011) implies a completely different movement strategy than when transporting trade goods or when moving in a ritual procession. Yet, these types of movement can occur over the same pathways and will be very difficult to disentangle on the basis of the material traces of pathways alone. Finally, in order to fully understand patterns of movement and their long-term development, ancient pathways cannot be studied in isolation from settlement patterns. The nodes in the network are where the decisions on movement are taken, where people and goods flow to and from. Questions of structuring of networks of communication and transport have however only recently begun to be approached by considering both the routes and the settlements, and standard methods to do so still need to be developed. The presented overview of current approaches to computer modelling of pathways and movement networks in archaeology shows its considerable potential for understanding ancient movement. Nevertheless, the technological integration of approaches needs to be much improved, or simply still to be done, in order to aid and clarify the analytical process. Within this integration, specific efforts must be dedicated to documenting the algorithms used and to offer a better understanding of their use by archaeologists. From a methodological point of view, this technological effort should be coupled to a systematic description of the data, analytical process, sensitivity analysis, and validation. These last two require new software tools, but can be done using straightforward and existing techniques. The major challenge is defining the best practices that we need adopt. Lastly, many debates remain open regarding the social interpretation of the materiality of past movement. The strong assumption of optimality behind most of LCP models deserves a deeper investigation and a more relativistic attitude, where optimality is seen as a hypothesis rather than a basic assumption. In a broad sense, the theoretical underpinning of models of ancient movement needs to be clarified and related to various conceptual frameworks of past movement. The use of ontologies could be a way to pursue this challenge.